ACCESS TO AND USE OF THIS WEBSITE: Is provided subject to the Terms and Conditions of Use which you should read carefully. By proceeding further you accept them. 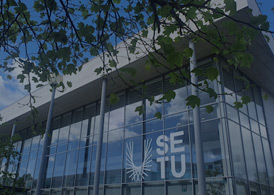 While the Institute of Technology Carlow has taken all reasonable steps to ensure the accuracy and completeness of the information on the pages of this site it can accept no legal liability in respect of any inaccuracy or incompleteness in such information. IT Carlow is NOT responsible for the contents of any off site pages referenced or linked to. DISCLAIMER OF LIABILITY: With respect to documents or files available from this server, neither IT Carlow nor any of their employees, makes any warranty, express or implied, including the warranties of merchantability and fitness for a particular purpose, or assumes any legal liability or responsibility for the accuracy, completeness, or usefulness of any information, apparatus, product, or process disclosed, or represents that its use would not infringe privately owned rights. COPYRIGHT STATUS: Unless otherwise stated, the copyright and any other rights in all material on this site are owned by IT Carlow. No part of this site may be reproduced or stored in any other website or included in any public or private electronic retrieval system or service without IT Carlow’s prior written permission. No use or display may be made of the names or logos of IT Carlow, without IT Carlow’s prior written permission.